After much speculation and anticipation Canon has finally unveiled the Canon EOS 5D Mark II, the long-awaited successor to the esteemed EOS 5D the world’s first full frame DSLR in a relatively compact and affordable camera body. The EOS 5D Mark II features a new 21.1 megapixel CMOS sensor, DIGIC 4 imaging processor and significantly lower noise, with an expanded sensitivity range from ISO 50 to ISO 25,600. The 5D mark II also sports a range of improvements and new features including 3.0-inch Clear View LCD screen with 920,000 dot/VGA resolution, Full HD video capture at 1920 x 1080 pixels and 30 fps, increased battery capacity and sensor dust reduction. 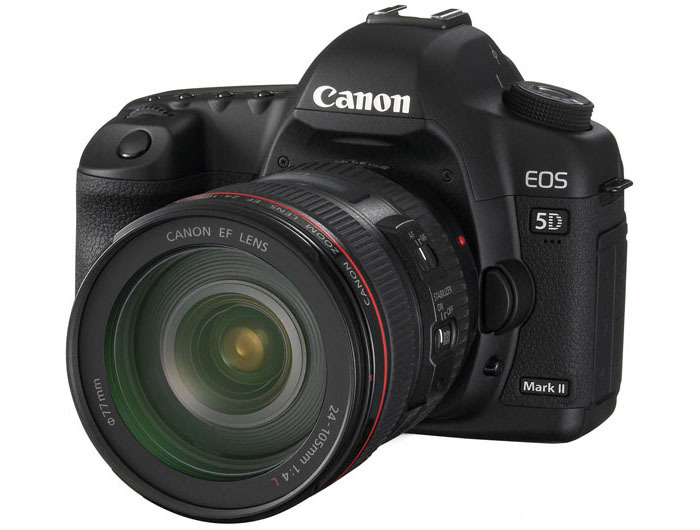 The EOS 5D Mark II will be sold in a body-only configuration at an estimated retail price of US$2,699. It will additionally be offered in a kit version with Canon’s EF 24-105mm f/4L IS USM zoom lens at an estimated retail price of $3,499. 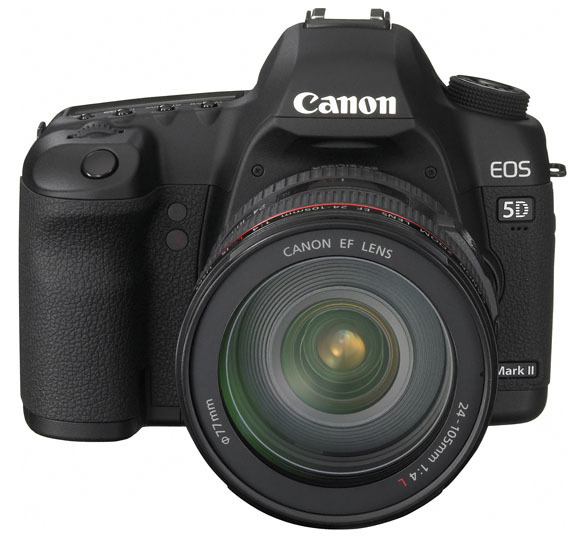 The EOS 5D Mark II will be available at the end of November. LAKE SUCCESS, N.Y., September 17, 2008 – Canon U.S.A., Inc., a leader in digital imaging, today introduced the EOS 5D Mark II Digital SLR camera, the long-awaited successor to Canon’s highly popular EOS 5D, introduced in 2005. Building upon the qualities that made the EOS 5D camera so successful, Canon has coupled the creative power of a full-frame CMOS sensor in a relatively compact and affordable camera body, together with groundbreaking HD video capture that opens the door to a much wider range of imaging possibilities for photographers. Along with the ability to capture full HD video clips at 1920 x 1080 resolution, Canon’s EOS 5D Mark II Digital SLR camera features a 21.1-megapixel full frame 24 x 36mm CMOS sensor, DIGIC 4 imaging processor and significantly lower noise, with an expanded sensitivity range from ISO 50 to ISO 25,600. “The anticipation surrounding the launch of this camera model has exceeded our greatest expectations, and we believe our loyal customers will be awed by the level of innovation and features built into the new EOS 5D Mark II Digital SLR. Once they have the chance to experience the camera, we believe they will agree that it was worth the wait,” stated Yuichi Ishizuka, senior vice president and general manager, Consumer Imaging Group, Canon U.S.A. Among the many advancements in Canon’s new EOS 5D Mark II camera is the Company’s proprietary DIGIC 4 Imaging Processor that powers the camera’s fast 14-bit analog-to-digital conversion for smooth color tones and exceptional gradation. The Canon EOS 5D Mark II Digital SLR offers a full-frame 24 x 36mm, 21.1 megapixel CMOS sensor and continuous shooting at 3.9 frames per second (fps) for an unlimited number of full-resolution JPEGs to the capacity of the memory card or up to 14 RAW images in a single burst when using a UDMA CF card. The camera includes a 15-point Autofocus (AF) sensor with nine selectable AF points plus six additional Assist AF points (three center AF points sensitive to f/2.8 lenses) with enhanced light source detection and AF microadjustment for greater autofocus performance. The EOS 5D Mark II camera also features a large, clear 3.0-inch Clear View LCD screen with 920,000 dot/VGA resolution, four times the pixel count of the EOS 5D camera’s 2.5-inch screen, for enhanced clarity and color when viewing images. The new camera is equipped with a high-performance, high-magnification optical viewfinder providing 98 percent coverage, giving a new dimension to the saying, “what you see is what you get.” Professional photographers will also appreciate the enhanced 150,000-cycle shutter durability of the EOS 5D Mark II camera. Canon, the first company to introduce a full-frame digital camera, has improved the EOS 5D Mark II Digital SLR camera’s newly developed full-frame CMOS image sensor. Utilizing proprietary Canon technology, the Company has reduced noise and expanded the sensitivity of the CMOS sensor up to ISO 25600, which is three full stops higher than the ISO 3200 limit of the original EOS 5D camera. Although the individual pixel dimensions of the EOS 5D Mark II camera are the same as the 21.1-megapixel CMOS sensor used in the EOS-1Ds Mark III digital SLR, the new sensor incorporates an improved output amplifier and a more advanced color filter that improves light transmission while retaining excellent color reproduction. By applying the same kind of advancements in sensor design and image processing technology as the recently introduced EOS 50D camera, but at higher resolution and with larger pixels, the EOS 5D Mark II achieves the highest level of image quality of any EOS Digital SLR released to date. With the combination of its improved CMOS image sensor and the powerful new DIGIC 4 image processor, the Canon EOS 5D Mark II camera provides ISO speeds from ISO 100 up to ISO 6400 in 1/3-stop increments, along with two high-speed settings – H1 and H2 – of ISO 12800 and ISO 25600, respectively, as well as a low-speed setting of ISO 50. The full-frame sensor maximizes the performance of Canon EF lenses, the world’s largest selection of autofocus lenses. Canon has taken its expertise in imaging, photography and video capture technology to a new level with the EOS 5D Mark II Digital SLR. Answering the question of where SLR technology is going next, the EOS 5D Mark II features 16:9 Full HD video capture at 1920 x 1080 pixels and 30 fps as well as 4:3 standard TV quality (SD) video capture at 640 x 480 pixels and 30 fps, both capabilities appearing for the first time in a Canon SLR camera. Video capture is part of the camera’s Live View function, using the Picture Style that has been set for Live View still image shooting. This allows skilled photographers and cinematographers to adjust image sharpness, contrast, color saturation and white balance, and have those settings apply to the movie image. When recording video, the camera’s rear LCD screen can be letter-boxed by a semi-transparent border to match the aspect ratio of the movie recording size. Moreover, the EOS 5D Mark II camera’s HD video capability enables new levels of creative expression through its unfettered access to the complete line of more than 60 Canon EF lenses, which provide an incredible variety of visual effects including everything from ultra-wide-angle and fish-eye to macro and super-telephoto, including many large-aperture L-series professional lenses that can keep the main subject in razor-sharp focus while blurring the background beyond recognition. The EOS 5D Mark II will record video up to 4GB per clip or a maximum continuous movie capture time of 29 minutes and 59 seconds, whichever comes first. Depending on the level of detail in the scene, a 4GB memory card can record approximately 12 minutes of video at full HD resolution or approximately 24 minutes in standard definition.i Video clips are recorded in .MOV format using an MPEG-4 video compression and sound is recorded using linear PCMii without compression. The new camera features an input terminal for external stereo microphones as well as a built-in monaural microphone for convenience. To help show off those fantastic movies as well as still photos, the EOS 5D Mark II camera includes an HDMI (High-Definition Multimedia Interface) output to display crisp, clear images on a High-Definition TV. For both still images and video, the Canon EOS 5D Mark II camera features Live View, one of the most sought after features in digital SLRs today. The 5D Mark II features three Live View AF modes – Quick, Live and Face Detection Live mode – for capturing either still photos or video, each with its own attributes. Quick mode automatically sets One-Shot AF using the camera’s phase detection AF system. It also allows users to select the AF point, even while the Live View image is displayed. Although the camera’s reflex mirror must be lowered briefly to take an AF measurement in Quick mode, it is the fastest way to set focus automatically when the 5D Mark II camera is set for Live View. Live mode uses contrast-detection AF with the image sensor and here, as with Quick mode, users can change the AF point using the Multi-controller. Face Detection Live mode uses contrast AF to recognize human faces. When multiple faces are detected, the largest face closest to the center of the frame is targeted as the AF point. While Live View is engaged users can still change settings including the AF mode (Quick, Live, Face Detection Live mode), drive mode, ISO speed, Picture style, White Balance, and more. The Canon EOS 5D Mark II Digital SLR camera automatically conducts peripheral illumination correction when shooting JPEG images, a function that previously could only be accomplished through post-image processing using software such as Canon’s Digital Photo Professional, which Canon supplies at no extra charge. Peripheral illumination correction evens brightness across the image field, making an image of a blue sky even toned throughout and reducing light fall-off at image edges. This new feature essentially eliminates one of the limitations of previous full-frame digital SLRs. Canon’s enhanced Auto Lighting Optimizer technology helps ensure each picture’s subject is clearly visible by analyzing image brightness and automatically adjusting dark areas in images so that they appear brighter. This function is ideal in high-contrast situations such as urban landscapes captured on sunny days, where the tops of buildings are brightly lit while street level details are obscured by heavy shadows. In this type of scene, the 5D Mark II camera’s Auto Lighting Optimizer technology preserves accurate exposure of the highlights while opening up the shadow areas for a more pleasing tonal rendition. Recently introduced with the new EOS 50D, Canon’s “CA” Creative Full Auto setting can also be found on the EOS 5D Mark II Digital SLR camera’s mode dial. This setting allows users to make image adjustments such as aperture or shutter speed through an easy-to-understand navigation screen on the camera’s LCD menu, allowing them to “blur the background” or “lighten or darken the image.” These easy-to-understand image options allow photographers to experiment with image options while still shooting in an automatic mode. For photographers seeking the flexibility and creative possibilities of shooting RAW format images, without the large file size, the Canon EOS 5D Mark II Digital SLR camera offers two more manageable file size options with sRAW1 and sRAW2 recording formats. At the sRAW1 setting, resolution is 10.0-megapixels with a file size that is approximately 25 percent smaller than a standard 21.1-megapixel RAW image. With the sRAW2 setting, resolution is 5.2 megapixels at less than half the file size of a standard RAW image, retaining all of the flexibility and creative possibilities associated with full-size, conventional RAW images. Wedding and portrait photographers, in particular, will appreciate the options of variable resolution and file size which allow them to fine-tune the 5D Mark II’s operation for their specific needs. Canon has equipped the EOS 5D Mark II with two Silent Shooting modes in Live View which will prove particularly helpful to law enforcement officials, and for behind-the-scenes shooting on movie sets. In Mode 1, the camera will shoot with the mechanical shutter open at the beginning of the exposure, using the electronic 1st-curtain function of the CMOS sensor and a reduced shutter-cocking noise, allowing multiple shots to be taken with minimal noise. In Mode 2, to minimize shutter noise during single frame photography, shutter cocking does not occur until the shutter button returns to the half-way position after shooting. With the introduction of the EOS 5D Mark II camera, the entire Canon EOS system is now equipped with the highly acclaimed EOS Integrated Cleaning System. The Self-Cleaning Sensor Unit for the Canon EOS 5D Mark II has been upgraded with a fluorine coating on the low-pass filter for better dust resistance. The Canon EOS 5D Mark II Digital SLR camera is compatible with Canon EF lenses and is scheduled for delivery by the end of November. 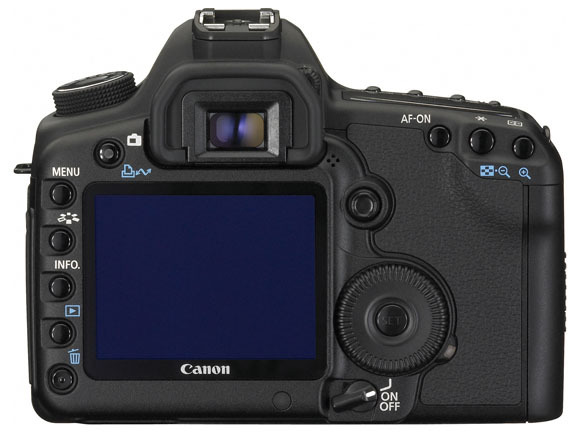 The EOS 5D Mark II will be sold in a body-only configuration at an estimated retail price of $2,699iii. It will additionally be offered in a kit version with Canon’s EF 24-105mm f/4L IS USM zoom lens at an estimated retail price of $3,499iv. This entry was posted in Canon, Digital Cameras and tagged 5D Mark II, Canon 5D Mark II, Canon EOS 5D Mark II, EOS 5D Mark II on September 17, 2008 by jonathanb.